As known by all, researcher identification numbers are used in order to prevent inconveniences occurring from authors/institutions name similarities in the studies conducted by researchers, academicians and scholars. ORCID information is decided to be employed in studies conducted in cooperation with TÜBİTAK (The Scientific and Technological Research Council of Turkey) TÜBİTAK ULAKBİM (Turkish Academic Network and Information Center) and YÖK (Council of Higher Education). In this context, the authors of articles are suggested to use “ORCID” information which also carries international validity. With the 2018 update of TR Dizin journal assessment criteria, adding ORCID information can be included as a criterion. ORCID is an abbreviation for Open Researcher and Contributor ID. ORCID is an ISO (ISO 27729) standard compatible, 16 digit URL. An ORCID account can be acquired under a minute and free of charge on https://orcid.org/register webpage. 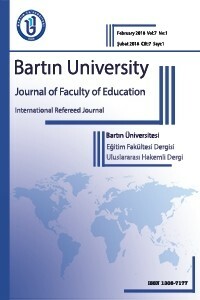 v The publication policy and writing rules of Bartın University Journal of Faculty of Education has been changed. Click here to view the updated template of the journal.